Denomination : Silver tetradrachm. Mint : Kition. Reference : Price-3107. Sear-6721 variety. Size : 25.4 x 26.4 mm. Weight : 17.31 grams. Grade : gVF and well struck on a large flan, but the coin has been cleaned a little too much. 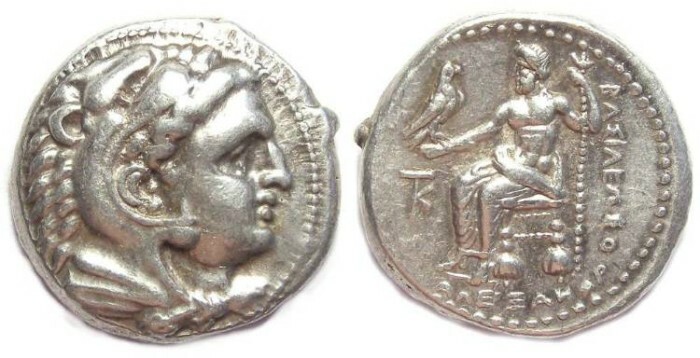 Reverse : Zeus seated left, holding a sceptre and eagle with a KIT monogram below his arm, with BASILEWS to the left and ALEXANDROU below. PLEASE NOTE THAT THIS COIN IS ATTRIBUTED TO A CYPRIOT MINT, AND THERE ARE SOME COUNTRIES INCLUDING THE USA TO WHICH IT CANNOT BE SENT. DO NOT ORDER THIS COIN UNLESS YOU ARE CERTAIN YOU CAN LEGALLY IMPORT IT TO THE COUNTRY IN WHICH YOU LIVE.